The Var (French pronunciation: ​[vaʁ]) is a French depairtment in the region Provence-Alpes-Côte d'Azur in Provence, in sootheast Fraunce. It taks its name frae the river Var, whilk uised tae rin alang its eastren bundary, but the bundary wis muivit in 1860. The Var is bordered eastlins bi the depairtment o Alpes-Maritimes; wastlins bi Bouches-du-Rhône northlins o the Verdon River bi the depairtment o Alpes-de-Haute-Provence, an soothlins bi the Mediterranean Sea. Toulon is the lairgest ceety an admeenistrative caipital o the Var. 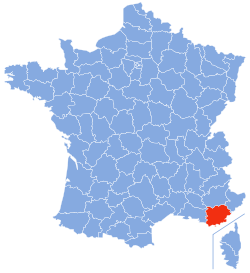 Ither important touns in the Var include Fréjus, Saint-Raphael, Draguignan, Brignoles an Hyères. The Var is kent for the harbour o Toulon, the main port o the French Navy; for its seaside resorts, the maist famous o whilk is Saint-Tropez; for some fine insaumples o Romanesque an medieval airchitectur, lik the Le Thoronet Abbey an Fréjus Cathedral; a for its wines, pairteecularly the wines o Bandol.